So here’s the photo, taken this morning. We’ve had a glorious few days with temperatures up to 19ºC and hardly any wind. Then yesterday the grey skies arrived again and this morning the rain had set in and the temperature was down to 5º, it’s approaching midsummer, a Scottish midsummer so winter had arrived again! 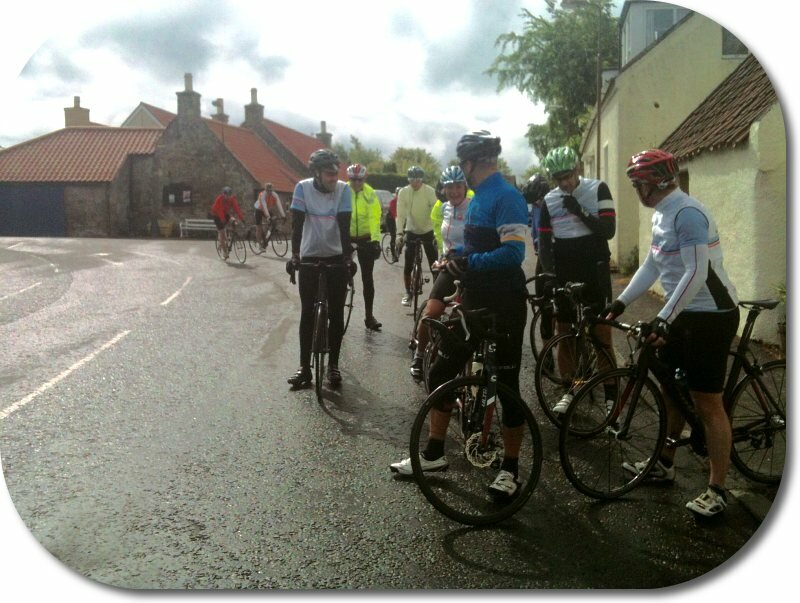 So donning a modicum of clothing, but still a bit foolishly I ventured out to join the Haddington Cycle Club. After a damp ride the few miles up to the town and then a wee loop as I knew I was early, I approached Samson on his pillar on top of the fountain. No-one was there, so I set off on another mini loop, just in an attempt to keep warm. When I arrived back folk were gathering. There were a couple of new folk so it was great to meet them and welcome them. It always gladdens my heart when newcomers turn up for a ride. Now we assembled, a complete dozen, and set off into the wind and rain down the way I had just come up, ah well. We squelched our way up past the wild ponies on Traprain Law, a local volcanic laccolith of Phonolitic trachyte (a kind of volcanic boil which hadn’t been lanced, there was a Roman silver hoard found there as well, but no chance of a sighting today). Then came the steeper climbs up to Whittinghame and Gifford. Despite, or maybe because of the rain everything looked just superb, vibrant greens and browns. Eventually we had a slightly longer stop than the usual catchups, at Saltoun, to munch a bit of sustenance. Saltoun is a lovely wee village, with a three angel statue, an unusual church with a spire on top of its tower and a blacksmith’s forge with a huge pile of old horseshoes outside. It’s brilliant on the rare occasions I’ve cycled past and a horse is being shod, with the forge roaring away, all red and gold flames. Today it was silent though, but the temperature had risen to a balmy 6º and the rain had stopped. The village was the first place in Scotland to have a barley mill in the early 1700s as well. After refreshment and chat we were off again, with chilly damp feet cooling nicely on the hurl down the hill. We got back to Haddington and I signed up, metaphorically, for an extra loop especially as it passed my house. So up the 6º climb out of the toon, and the temperature rose to faintingly hot 12º with glimpses of sun, before I arrived back home after a somewhat damp 44 miles and bid farewell to the group on the loop. So history, geology, statistics, meteorology, equines, pain and suffering as well as joy, what more could you want in a story? And tomorrow, hopefully, two wheel adventures of a different kind! This entry was posted in blacksmith, challenge, climb, cold, cyclist, Fossil cyclist, new, rain and tagged challenge, cycling, East Lothian, fossil cyclist, hills, photograph, ponies, rain, Roman, Samson, Scotland, silver, weather, wind on June 14, 2015 by fossilcyclist.